Alternatives to Detention (ATD) partners with youth and their families to turn potentially frustrating and challenging interactions with law enforcement, Juvenile Court, and Probation into overall positive experiences in which families’ voices are heard and their needs are prioritized. ATD provides detention alternatives to low-risk juvenile offenders to successfully transition out of the Juvenile Justice system and avoid recidivism. Youth and their families receive the resources needed to navigate the juvenile justice system and address the needs underlying the youth’s arrest. ATD works together with both the individual youth and their families holistically on anger control/positive coping skills, positive decision making, and healthy relationships. Every step of the way, the SAY team becomes someone to talk to and share with, while for their parents, serving as a source of support and guidance. Using quality and tested strategies, including Brief Strategic Family Therapy and TARGET (Trauma Affect Regulation: Guide for Education and Therapy), youth learn it is okay to have feelings, communicate, and better understand how to cope with stress and trauma. These services are offered in the home. ATD also offers temporary safe alternative housing options for youth needing to disengage, deescalate, and/or stabilize out of their home environment as an alternative to juvenile hall. ATD partners then work with the youth and their family on reunification. 76 youth participated in the program and 59 completed the program. 85% of those completing the program remained arrest-free at the time of case closure. Funding Partner: San Diego County Probation through a partnership with South Bay Community Services. Eligibility: ATD receives referrals from the San Diego Police Department, San Diego Unified School District Police Department, Juvenile Probation, and Court. 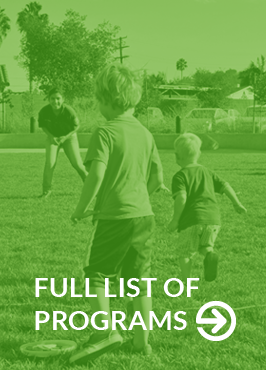 This SAY program serves youth and families who reside in the Central and North Central regions of San Diego.